Paint the Pavement is a city-wide initiative that helps foster community building between artists, businesses and residents through the act of placemaking. Community members help to decorate their city streets in beautiful murals, transforming public spaces into neighborhood assets. 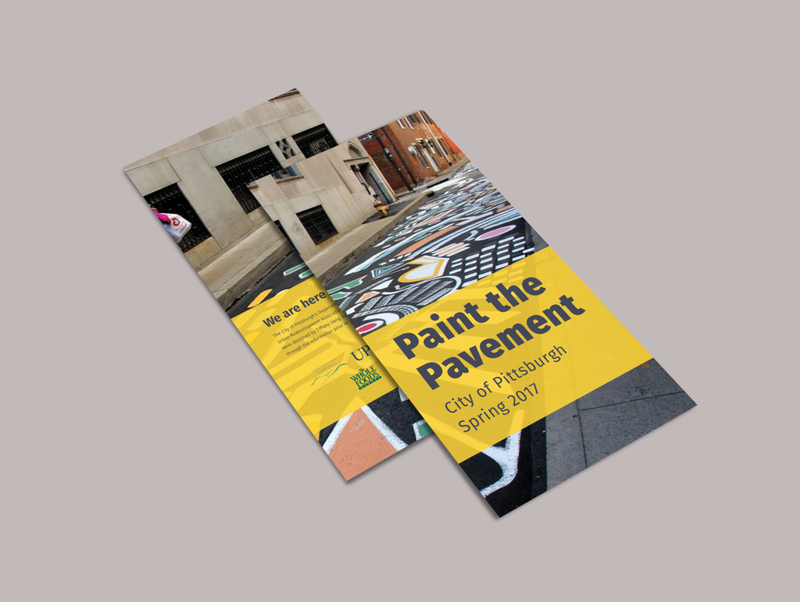 Pittsburgh will be the next city to host Paint the Pavement in 2017. I have been called on to develop the visual style and branding for the marketing materials used in introducing the campaign to residents. The colorful, fun-filled deliverables should help spark creative ideas and conversations amongst readers while also informing them of the ways to get involved. The pamphlet explains how to submit a proposal from start to finish. In addition to the brochure, community members receive a checklist with the application forms in the mail. Delivered all together, these helpful resources make the process of sending in a proposal a lot more efficient, simple and fun! First, I read through the copy provided by the client to better understand the campaign's details. I wanted a better grasp on what tone I should be conveying through my designs. Who is my audience? What age group am I targeting? I started to highlight parts of the document that I felt should be read or prioritized upfront. Then, I created a diagram to document how the content should be read. Defining this specific flow of information was a critical step in my process. I needed to have a good idea in my head of how I wanted to present all the information without making it be overwhelming. The wordmark had to strike a balance between referencing something unique about Pittsburgh and the focus of Paint the Pavement. I chose to highlight one of Pittsburgh's famous icons: the bridges. Named after famous icons like Andy Warhol, these bridges act as the glue that connects one neighborhood to the next. They hold the communities together, both physically and symbolically. These bridges have been there since the birth of the City. They have been permanent markers amidst all the expansion and change that the city has faced. These bridges have really seen it all. Below are different variations of the wordmark, with the final one shown at the far right. Helpful guidebook filled with information on why the reader should partake in Paint the Pavement. 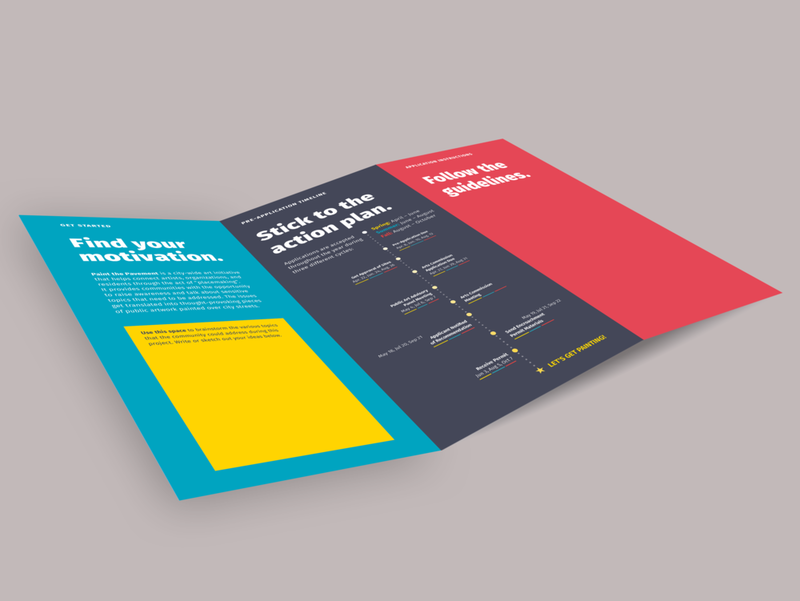 The vibrant handouts showcase a cohesive primary color palette. The bright, fun and saturated colors help to evoke childhood memories of our primary school days, when we drew with markers and crayons. I wanted the design to appeal to children as well as adults so that entire families could feel like they're a part of the application process—not just the parents or older adults. The initiative is meant to be a celebration for everyone of all ages and backgrounds. The design of the icons scattered throughout the branding is also meant to bring about nostalgic feelings. The simple rounded icons complement the colors, bringing readers into a creative atmosphere.